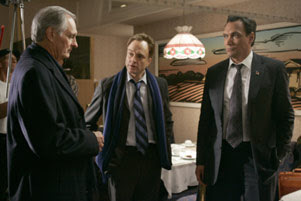 Which West Wing--fact or fantasy? I found a cafe with wifi here in CT (Thank you "Brew") and couldn't resist blogging about a New York Times article that talks about the fictional West Wing and the current election we have going on, especially because David Axelrod (Obama's chief strategist) was contacted by one of the head writers for The West Wing in 2004 when they were developing the character of Matt Santos, a non-white, "minority" senator with a mixed-race family background who is going head to head against his Republican challenger, a senior senator from a Western state who is known for telling it like it is. For those of you who aren't West Wing fans, I can only tell you that the parallels are downright eerie. And I didn't even KNOW about the Phillies connection. I only hope that our current election has as happy an ending as the fictional one (albeit without the tragedy of the V.P.--but they had to build that in since actor John Spencer did die in the middle of the series). I've been meaning to chime in about the topic of patriotism and the rhetoric coming out of the Republican party about who "qualifies as a "real" American, about which sections of the country are pro-America, and about who gets considered "anti-American" versus who is a "true" American. “Where are you from, anyway?” he asked, squinting his bitter blue eyes at me. He shook his head and glared and wiggled a crooked finger inches from my face. “No, no . . . What are you?” He whined with frustration. The sentiments expressed by the protagonist of this novel, Jane Takagi-Little, are ones I COMPLETELY identify with--and which I recently blogged about. And this is a theme that recurs for many Asian Americans (and other immigrant groups as well, particularly non-white immigrant groups). That somehow, because we are not white, because we are "hyphenated" Americans, we are not "real" Americans. This theme has certainly replayed throughout history--the Japanese American internment was in large part based on the belief that Japanese Americans were not loyal to the U.S. but instead were "foreign enemy aliens"--even if they were born and raised in the U.S. So I take particular offense at the rhetoric coming out of the Republican party and by Sarah Palin, Robin Hayes, and Michelle Bachman specifically. Because the idea that somehow I'm not a real American because I have an Asian face, because I was born in NYC and raised in CA (ie: NOT in the heartland of the U.S.), and because I'm a liberal academic elite--that these markers somehow mean that I am anti-American, unpatriotic, and "fake"--I just find that repugnant. And insulting. And demeaning. And wrong. I do not wear a flag pin. I do not pledge allegiance to a flag in my classroom. I do not write in this blog that I love America. But none of these things disqualifies me from being an American. And neither does my dissent of the opinions of the current administration. Or my critique of race in America. Or my criticisms of America in general. In fact, as I've said countless times in other blog posts, dissent is one of the most American things I can think of. Dissent in a respectful way. In a way made to push us to be better. To do better. I am an American. A real American. And there are times when I do feel pride in my national affiliation. And there are times when I feel shame and sorrow. But throughout it all, I do appreciate being able to feel both pride and shame, and to express these in this blog, in my class, in my research, and in my day to day life. And anyone who says otherwise does not know American history and does not appreciate true American diversity. And so you have to wonder, how "American" can THAT person be? *New York Times Op-Ed columnist Frank Rich writes a great opinion piece, "In Defense of White Americans" that is an elegant deconstruction of Republican rhetoric and the disservice it does to white Americans in thinking that race baiting will work. *My blogging sister, Tami of What Tami Said has hit the big time and has a post of hers featured in The Huffington Post, "Middle Americans Are Not Just White, Christian, Working Class Folk." As usual, Tami's eloquence and rhetorical fire leaves me feeling hugely impressed. *Poplicks takes on the McCain volunteer who used the classic "black male attacker" stereotype as a last ditch effort to get her candidate elected. By the way, for all you regular readers, I'm heading to a conference tomorrow and will be without reliable internet until Election Day, so please bear with me on publishing comments or responding to comments or writing new blog posts. I'm sure I'll have LOTS to write about come Wednesday, November 5. I know I said last week that I would be discussing Asian Americans and inter-racial dating. And then my week got away from me. And I know that in July I began to broach the subject of inter-racial dating and why some inter-racial couples may seem to be more acceptable than others. For example, Asian American women paired with white men seem to be a prevalent pairing that we see out and about and reflected in popular culture, television. And in this previous post I also acknowledged that inter-racial pairings between black women and men of other racial groups and Asian American men and women of other racial groups seems to be the least common pairings that we see. And interestingly enough, since I am not the first person to make this observation, there are people who have started websites and dating blogs that are dedicated to "BlAsian" couples: black women romantically linked with Asian/Asian American men. And I do wonder about this. I mean, not the specific pairing of African American women with Asian American men, but the idea that these two demographics may be in the category of those who do not date across the color line. And one of the other things I have been thinking about regarding inter-racial relationships, is whether there isn't also a correlation between community acceptance and/or the prevalence of certain pairings. I'm not a sociologist and don't have stats readily at hand, but from what I recall from reading various articles on this subject, Asian Americans of either gender are more likely to date and marry white Americans than other groups. And part of me wonders about the acceptability of dating and marrying inter-racially outside of a white demographic. Because anecdotally I have heard of some Asian American families being very opposed to their sons/daughters dating let alone marrying African Americans. I'm not trying to say that all Asian families are conservative and racist. Nor am I saying that all Asian Americans support inter-racial dating/marriage with white Americans. But I do think that Asian American families have their own prejudices to grapple with--and I wonder how we can start to address these issues in Asian American communities (I don't mean within academia or activist circles, I mean literally in the suburban areas where people live). But maybe I'm wrong. My own family has varying attitudes towards inter-racial dating, whether white or black (or any other identity--although interestingly enough, my paternal grandparents were livid when they discovered one of my cousins went to the prom with her Japanese American childhood friend because they had lived through the bombing of China by the Japanese army during WWII and hated the Japanese with a loathing that can only be bred by living through war). I feel patriotic today . . . If you CAN vote, you SHOULD vote. This is the most American thing you can do, but more importantly, it's your RIGHT to vote and your RESPONSIBILITY. Almost every state in the nation has early voting--and if you missed registering, most states allow you to do one-stop shopping by registering AND voting at the same time. By now everyone who isn't living under a rock has heard of Colin Powell's endorsement of Barack Obama--his explanation is very eloquent but even more his wise words about not confusing and equating Muslim Americans and Arab Americans with terrorists is a bucket of ice water that we need on the anti-Islamic rhetoric that keeps popping up. P.S. Yes, I know I promised a real post about inter-racial dating taboos, and it is coming, but it is too tempting to post these videos, especially because the political junkie in me just can't resist. I recently came across this entry in Angry Asian Man about the National Asian American survey that polled Asian American voters across the nation (in 8 different languages--so it's the most comprehensive political polling of this particular racial group to ever happen) and discovered that overwhelmingly Asian Americans supported Obama (41%) over McCain (24%). Gay marriage supporters "have very cleverly portrayed homosexuals as a kind of minority,'' Tam said. "They've been very effective in portraying it as a civil rights issue, and this is very much a concern for us. We hope to convince Asian-Americans that gay marriage will encourage more children to experiment with the gay lifestyle and that the lifestyle comes with all kinds of disease,'' Tam said. Oh Bill Tam, you poor misguided soul, with your rabble-rousing, fear mongering message of equating a particular type of person, a minority group, with an unsavory lifestyle rife with disease. This sounds familiar...this sounds like... WAIT A MINUTE! This is what people used to say about Chinese people living in California in the late 19th C.! Chinese women were accused of being promiscuous and lascivious and prone to all sorts of venereal diseases, and Chinese men were also accused of being nasty rat eaters who allowed vermin to infest their homes and who subsequently brought about all sorts of disease! Oh Bill Tam, you are using late 19th C. rhetoric by white Californians that led to the Chinese Exclusion Act in 1882! Oh Bill Tam, you are using RACIST RHETORIC to support a bill meant to exclude a group of people for no other reason than bigotry and prejudice. Ironic, no? Here's the thing though, the Bill Tams of the world aside: Asian Americans are not as conservative a group as you may think. I mean, I know that there are these stereotypes of ultra-conservative Asian Americans who only care about money (hence the number of registered Chinese American Republicans, which my Mom likes to remind me of recently--she's a rabid Democrat but has some Republican leaning friends and right now they are driving her CRAZY) or who come from traditional Asian cultures that frown on gay lifestyles (or which don't even recognize queer as as category). Anyway, for all you Asian Americans in California and across the nation that are taking non-conservative stances in the upcoming election season, I say BRAVO! Especially bravo because you are breaking stereotypes about conservative and a-political Asian Americans. Especially my own family--I want to give a particular shout out to them (you know who you are) because after all, how could I have become so social justice minded if it weren't inculcated in me from the very beginning? Why do you want to know where I'm from? Recently I was asked to give a talk about race and diversity, specifically to talk about my own experiences as a woman of color in higher education. So I drew upon some of the themes that I've discussed previously in this blog--about the definition of race as we know it (in terms of the "racial pentagram"), the difference between "institutional racism" versus "individual discrimination," about my own identification as an Asian American woman, and about the question that every Asian American person I know has been asked at least once (and usually many times), namely: "Where are you from?" with the implication, oftentimes, that a person isn't looking for your current home address; rather, what the questioner wants to know is what your ethnic ancestry is. The talk was really fun--and the question and answer period, which I used more as a general discussion, was the best part, because it was an opportunity for people to talk to one another, albeit through me. In other words, I didn't want to just stand up as the "race expert" because I think everyone has their own experiences, and hence expertise, when it comes to race. And really, after one person has been talking for 40 minutes, the last thing anyone wants is to keep hearing the same voice answer questions. "Is there any kind of question that you would prefer to be asked with respect to your background/ethnicity? Was there a way that the man who insisted you were Hawaiian could have asked his question without offending you?" I thought about it for a moment and then did the teacherly thing that I sometimes do, which is to flip it around and look at it from a different perspective. Because the thing is, there's nothing wrong in asking someone where they are from or, if it is the ethnic ancestry you are interested in, there's nothing wrong in directly asking someone, "What is your ethnic ancestry?" I've done it recently with a student in my class who appears to be South Asian but had indicated through different references that he might have Indian heritage, and so during office hours I asked him directly what his ethnic heritage was because it was in relationship to a conversation we were having about people taking off their shoes before entering one's home--and it was a point of common cultural practice between Indian households and Chinese households (and I dare say a number of other cultures do this as well, like Korean and Kenyan). So what I said to the questioner was that it wasn't so much how it was asked or what was asked but it is the motivation behind the question that I'm interested in. For example, a nurse who was inserting a needle in my arm during a blood drive once asked what my nationality was. I am not sure if it was the tone of her voice or the fact that she was about to stick a needle into my arm, but I didn't get defensive or reactionary (for example, I didn't scream I AM AN AMERICAN CITIZEN IF YOU WANT TO KNOW MY ETHNIC HERITAGE THEN JUST ASK) instead I simply said "I identify as a Chinese American." She got very excited and started to tell me about her Chinese American granddaughter--and at first I wasn't sure if her son had married a Chinese/Chinese American woman or had adopted a girl from China, but it soon came out that it was the latter and that her Chinese American grandchild was always asking her grandmother (who worked for the Red Cross) if she met any Chinese people in the largely homogenous (read white) area of Western MA where we were having this conversation. In other words, for the white American Red Cross nurse, her motivation in asking me my nationality was very personal and rooted in finding resources for her granddaughter in discovering her ethnic heritage. For the Staples guy? It seems as if his motivation was simply to tell me I should get to know my culture better and to show off HIS expert knowledge about China and Chinese society. And quite frankly, I have all the patience in the world for the nurse and none whatsoever for the "China expert." Because the nurse seems to desire a true interaction and a conversation whereas the China expert seems to want to talk at me rather than with me. Labels: questions Asian Americans are always asked, race, where are you from? Palin supporters turned on reporters in the press area, waving thunder sticks and shouting abuse. Others hurled obscenities at a camera crew. One Palin supporter shouted a racial epithet at an African American sound man for a network and told him, "Sit down, boy." To his credit, John McCain has tried to address some of this ugliness. A New York Times article discusses how McCain tells his supporters that they shouldn't "fear" an Obama presidency and when another woman says she is afraid of Obama because he is an Arab, McCain shakes his head, says no, and tells this woman and the crowd at this Minnesota rally that Obama is a decent family man. And I appreciate that McCain is trying to calm down his crowd and be respectful towards his fellow running-mate, but in a lot of ways, this is reaping what you sow. In other words, certain members of the Republican party have been clamoring to have McCain and especially Palin attack Obama's character and trying to link him to "terrorists"--of course what they are doing is old-fashioned rabble-rousing, with the added element of institutional and historic (and recent) racism on their side. So this is what I want to know. Where is the Republican leadership? I'm not just talking about John McCain and Sarah Palin and their campaign. I'm talking about others, like the primary candidates, Mitt Romney, Rudy Giuliani, Fred Thompson, and the Bush administration. Where are THEY on calling on all Americans but especially McCain supporters (especially members of the Republican party perhaps since I'm assuming this is the demographics at these rallies) to be better than this rhetoric of hate and fear and prejudice. One Republican representative from Illinois has called on Palin to stop attacking Obama, saying that this campaign should be "better" than these tactics. But where are other leaders and politicians saying that McCain supporters, especially white McCain supporters (because honestly, (A) That's the majority caught on tape making these remarks (B) That seems to be the majority demographic at McCain/Palin rallies) should be at the forefront of talking about racism and prejudice and denouncing these acts. [Final Note: I'm not saying that all Republican or John McCain supporters are racist or more prone to racist tendencies. Obviously with the recent discussions of independent voters and die-hard Democrats struggling with their own internalized racism, we know this isn't the case--even with Obama's supporters of all hues, there's bound to be a fair amount of internalized racism. But as someone who has been to two different Obama rallies in the last year and a half, I have to tell you that I have not witnessed the kind of animosity and hatred that seems to be bubbling up in these clips. And at a rally during the primary that was held at Southern U., when Obama talked about John McCain and people booed, he told them that John McCain was a good man--and that he wanted his campaign not to devolve into the typical character assassination--for us to concentrate on the future and on a positive message of hope and change. And I think, for the most part, that has been the tenor of his campaign. THAT One...what did he mean? So yesterday was the second presidential debate--this time in a "town hall" format. Tom Brokaw was the debate moderator and the picture below shows the post-debate "thank yous" between the two candidates, their wives, and Tom. In the post-debate spin, there's been a unanimous belief that Barack Obama "won" and that it wasn't a "game changer" for McCain, which he needed it to be given the fact that he is down in the polls. In a moment that suggested Mr. McCain’s impatience with his opponent, he described the differences between the two candidates on energy policy. In the MSNBC post-debate discussion, Chris Matthews and two talking heads (whom I can't recall right now) dissected the "THAT one" moment, with one politico noting how unfortunate that phrase was since McCain should have been more aware that gesturing at Obama and using this phrase in the dismissive manner that he did would hit some people the wrong way (ie: McCain is going to look like a racist, although the dreaded "R" word never came up in the politico's commentary). Matthews and the other talking head dismissed the racial/racist overtones, and declared that his snideness was a result of his age rather than any inherent racism. And actually, I agree. Or rather, I wouldn't be too quick to say that this particular snide instance was an example of McCain trying to be "racist." Dismissive? Yes. Condescending? Definitely. Deliberately meant to be a put down of Obama? Absolutely. A veiled racist phrase? Harder to interpret. McCain's no dummy--he's not about to use coded racial language during a televised debate in front of million of voters. This is NOT the time to start calling his opponent Barack HUSSEIN Obama (which IS in my opinion, a racist reference to Obama's Muslim heritage--so every time one of McCain's surrogates refers to Barack HUSSEIN Obama, it's really meant to remind everyone, HEY boys and girls, this guy has the same middle name as a deposed Muslim despot). For a pretty funny dissection of the phrase "THAT one" head over to this site, where you can also see a clip of McCain making this remark--see for yourself and weigh in on what YOU think about "THAT one." Yesterday I had lunch with my friend "D," a political junkie like me, and we were discussing Sarah Palin and I mentioned that I thought that like Hillary, she was enduring a fair amount of sexism and scrutiny rooted in sexism by the mainstream media, political pundits, and progressive-liberal Democrats, and Obama-maniacs (and I count myself in the last 2 categories), and maybe her harshest critics are other women of all political stripes. When "D" asked for examples of sexism and comparisons of what Palin is facing versus what Clinton faced in the primaries, I noted that one thing was the belief that opponents can't be too hard on Palin for fear of charges of sexism--that we can't expect Palin to stand on her own two feet and that particularly men have to be careful of being perceived that they are being too hard on her. And I mentioned my own harsh critique of Palin, wanting her to be smarter and more knowledgable than she appears to be, to which my friend said that there was nothing wrong with having high expectations (or even just basic expectations) for political candidates for higher office. But on reflecting more about this, I do think that the scrutiny around Palin has some hints of sexism--at least that as a woman in politics, like Clinton and others, Palin is not immune to the double-bind expectations that we have of women in the public sphere. That they have to be feminine, and yet not too feminine. That they should be both independent and yet utterly maternal and devoted to their families. And I think that for some partisan folk, it's easier to go after Palin rather than McCain because McCain seems untouchable in certain ways--due to his stint in the Hanoi Hilton, his age and health (although there are some really awful commercials hinting that his cancer is more wide spread than he is leading us to think and that he may keel over any minute--the ad is sponsored by some independent group but I can't help thinking that it was in such POOR TASTE and I'm not sure if it was an ad meant to hurt or help Obama, because if people THINK that this group supports Obama it could actually backfire and help people sympathize with McCain. Either way, it was a BAD AD). So we go after Palin. And to be fair, there's a LOT to go after. So it's not entirely the fault of the media or pundits or Democrats. But still. I think that in some ways, going after Palin takes away from what this election should really be about--how to get our nation going in a progressive direction (at least it is for me). I also find it odd that more scrutiny of Cindy McCain doesn't hit the mainstream. Because I recently read a piece in The New Yorker about her that was just disturbing. Among other things, McCain's adoption of Bridget without consulting John McCain (she also got her pilot's license without ever letting him know she was taking lessons), and her deliberate forgetting that her father had a family that he left for her Mom (in other words, Cindy has an older half-sister yet consistently refers to herself as her father's "only child" which is offensive to say the least and a stark contrast to the Obama family dynamics), and the separate spheres that she and John McCain seem to lead their lives. Finally, for a BRILLIANT post looking at the intersection of racism and sexism, head over to What Tami Said for he post entitled "Dear Liberal Elites" (yes, that means ME and YOU). As usual, Tami said it much better than I ever could. And click here for an interesting piece in the Baltimore Sun about a dissection of SNL's political satire. Like many of you, I was glued to my tv set yesterday from 9-11pm (OK, truthfully, 9-12am because I was watching all the post-debate spin and punditry as well as reading the live blogs and politicos on line). And as a continuation of a post I wrote a few days ago titled cheekily "In defense of elitism" I want to clarify some of what I wrote in that post in light of the interesting discussion thread that follows and in light of last night's debate. I never thought Sarah Palin would totally go off the rails. I thought it *might* happen, and I thought Joe Biden also *might* make one of his notorious gaffes. But the debate pretty much was what I thought it was going to be--Palin didn't repeat her "deer in the headlights" moments ala Couric interview and kept to the script that her handlers gave her (the woman was a communication studies major and had a job as an on-air newscaster--she knows how to look directly into a camera and punch certain sound bites). And Biden gave an impressive debate performance in terms of demonstrating that he had a plethora of facts and figures at his fingertips as well as deep and wide knowledge about domestic and foreign affairs (and a deep history in the Senate and familiarity with John McCain's record). I know that everyone is saying that Palin did well because she staunched the bleeding from the CBS interviews and because she reassured the conservative base that she was firm on issues near and dear to the "right" (anti-gay marriage, smaller government, "winning" the war in Iraq). In other words, she showed up, didn't fall on her face, and stuck to talking points, sound bites, and campaign slogans and did fine, even if she didn't seem to answer questions directly or with any specificity. Biden, on the other hand, clearly demonstrated a grasp of the questions and the underlying issues AND provided clear answers that showed, again, his deep knowledge and ability to synthesize information from various quarters and on his feet in a debate format. And the pundits and America seem to agree since all the polls I've seen (including CNN) show Biden as the clear "winner" of last night's debate. And here's what I'm left with. Biden had more knowledge. And an ability to synthesize that knowledge. And THAT is what I care about. Someone who is able to synthesize a wide as well as deep body of knowledge. A college education or law degree doesn't guarantee that someone is able to do this. But you know what? It doesn't hurt. In fact, I'd argue that a college degree, while not being a barometer for intelligence, is a barometer for diligence. For being able to follow a schedule of classes and set of requirements. And a higher degree, law, grad school, MBA, demonstrates an ability to take this training and thinking to another level. And THAT is important. Knowledge. The celebration of knowledge. Not for it's own sake--not to make one superior--not to be celebrated as self-aggrandizement. But knowledge as power, particularly the power to make change in yourself, your community, and your world. THAT is important. Because knowledge IS power. We need to arm ourselves with as much knowledge as we can, about global climate change. About international issues that impact our domestic crises (the housing market, gas prices, rising cost of living--we are living in a global world--trade with foreign markets, particularly China is crucial to U.S. economic stability right now). The issues we are facing in our nation, today, are complex and complicated. I want knowledge to be celebrate and lauded in our leaders as role models for our children and students--that we NEED people to be smart. We NEED people to want to pursue KNOWLEDGE--of all kinds (I need a new roof--and clearly I DO NOT have the knowledge to put on shingles and assess the state of my current roof, but I KNOW that there are people I can call for their expertise and KNOWLEDGE to replace my roof). I wish we embraced knowledge more. Not just a rhetoric of "folksiness" or a series of facial gestures (all that winking that Sarah Palin did seemed bizarre to me). I would have been reassured if she had been able to give answers that reflected her synthesis of the information and her clear KNOWLEDGE of the subject and not just a parroting back of sound bites and campaign slogans. So for me, the clear winner was Biden and the clear ticket to support in November is Obambiden, because I want my leaders to be people who demonstrate KNOWLEDGE. Yes, yes, yes...it IS another skit mocking Sarah Palin (sigh). Please...send me references to skits mocking John McCain--I'll gladly post them! I do think that these skits are part of a larger issue regarding sexism and politics. I had this conversation last night with some friends at dinner. As you can probably guess, my friends are of the elite, liberal ilk (and many of them are professors to boot) and they were talking about the thrashing Sarah Palin was going to suffer through during tomorrow's debates with Joe Biden. This is a common theme I have been hearing around town among Obama supporters--that they expect tomorrow's debate to be a verbal smackdown. But I'm not so sure. And I think that one of the things I've been hearing, that Biden has to be careful about his "tone," that he can't be too "mean" towards Governor Palin, that he can't appear to be "sexist," well, what all of this means is that there is this idea that as a woman, Sarah Palin needs to be handled in a certain way. And this belief, that a man can't treat a woman as an equal, is a sexist attitude. I think it's something we ALL do. Like the legacy of racism, sexist attitudes are embedded in our daily lives in ways we often never recognize. And they often go uncommented on. Case in point: a friend who is a mother notes that when one of her male colleagues brings his infant daughter into the office, people note what a good Dad he is for taking care of his daughter and taking part in child care. Whereas NO ONE ever says the same of my friend, who also brings in her infant daughter to the office (academia allows this more easily than other spaces) from time to time. But getting back to Sarah Palin and the Vice Presidential debates tomorrow, I don't know if it will be the thrashing that so many folks seem to think. I haven't been impressed by her AT ALL. Certainly not her record as mayor or governor. Nor the rhetoric she has used in her speeches. And definitely not during her interview with Katie Couric or with Charlie Gibson. I don't have high expectations for her, not because she has ovaries but because she seems unprepared and underqualified to discuss issues of foreign affairs and domestic public policy in our current time, nor does she seem to have a grasp of history and how we feel the effects of history right now (and I'm thinking of the current financial crisis most especially). However, Palin could surprise us all. By just hanging in. By just being competent. There is so much extra expectation of how well Biden will do and so much speculation about whether or when Palin will fall on her face. All she has to do is show up and hold herself well and she will be granted the winner. And this, too, is part of sexism I believe. That we are deciding to hold her to a different accountability because of her gender. No one, of course, is saying this. But I feel it everywhere implied. And quite frankly, I wish people would stop worrying if they are seeming "hard" on her and just treat her the way they treat any other male politician. That seems the most respectful thing to do. Labels: Joe Biden, Sarah Palin, sexism that passes for the norm, SNL, Tina Fey, VIce Presidential debates, why do people like to mock Sarah Palin so much?